Having a website and posting and sharing it on social media only will not give benefit to website owners. The main goal of every website owners is to make their website displayed on Top of Search Engine Result Page. Before 10 years, there were not so many website and blog so there were not any big competition. But nowadays this competition is so much hard since the number of the website is growing day by day. To get a website on the top page of Search Engine like Google has become a very clever and tricky task. So, then optimizing a website on the website page as well as outside the website to increase the rank of search engine and to attract free traffic source is Search Engine Optimization (SEO). SEO will help to display a website on the top rank of the search engine result page among many websites. SEO can be categorized in two ways: White Hat SEO and Black Hat SEO. White Hat SEO Technique is a popular and trusted as well as a beneficial technique for optimization technique. White hat SEO is a slow process, it gets started working after about 2,3 or 4 months also. White hat SEO is mainly concerned with On Page(On-Site)s.e.o and Off Page(Off-site) SEO techniques. Here we are concerned in responsive theme or template selection, quality content writing, tag optimization, internal linking or hyperlinking, Meta Description, keywords analysis, Title Tag, Social Media share Button including robots.txt and submitting the site to google webmaster tool. Performing SEO techniques outside a site. It is a Link Building strategy or backlinking technique. 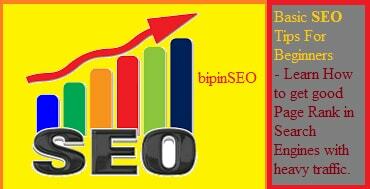 Here we build such quality backlinks. Different Off-Page SEO techniques are Guest Posting, Directory Submission, Blog Commenting, Forum Posting, Social Bookmarking, Social Media Optimization (SMO). Backlinks and Traffic can be obtained by all these Off-page SEO techniques. Obtained backlinks either may be Do-Follow or No-Follow. Better High PR Do Follow backlink = Better ranking of your site. On the other side of Search Engine Optimization Technique, there is the fastest method of attracting free traffic sources and visitors to your site. Black Hat SEO includes Hidden content, Cloaking, Meta Tag Stuffing, Gateway Pages, Mirror Websites, Keyword Stuffing, Page Hijacking, Meta Stuffing. However, you can get a fast result with Black Hat SEO but your site or blog will be totally banned by search engines and your site will not be crawled and indexed. If a website is slower, not user-friendly and does not fit to screen of all devices then a user will not feel easy to surf a website and no longer engaged with it. And Search Engine like Google always provides the best result for users so irresponsive and slower website will not be displayed on Search Engine Result page. Therefore making a user-friendly and fast loading website may lead to getting a better rank and traffic source from Google. 2. Write such an attractive title of your post and note that your title should always be related to the content you're writing. Include your main targeted keywords inside Title. 3. Write your own content and do not copy paste from others because search engines like google, yahoo, bing neglect copied content, search engine always rewards for only unique and attractive content. 4. Use some long tail keyword or short tail keyword based on your content because it makes easy for Google to find your post with keywords. Read an article on How To Use Meta Tags and search description?. 6. Share your post link to social media like -Facebook, Twitter, Bloglovin, Linkedin, Reddit. 7. Go to neilpatel.com so you can analyze your site and Neil will recommend your errors and will give free advice on your site. 8. If you really want to become a good blogger then don't miss this useful step; you should check your site or blog to Google Search Console. Google Search console (webmaster tools) will show your errors and show your positions on Google, your internal links, your clicks and many more. It will show your crawl state on Google. 9. Set International Targeting on webmaster tool (google search console) so it will help your site to be listed in the top rank of google on a specified targeted country. Example: if you set your site's international target to the USA then you will get free traffic source from the USA.